No Pilot's License is Required! Add a trainer flight in the Extra 330 or Game Bird GB2 to get the most from your L-39 flying adventure. A flight in one of these high-performance aerobatic propeller aircraft can help boost your g-tolerance and provides an opportunity for you to experience the sheer power difference between the aircraft. * All prices are based on exchange rate at the time of purchase and are subject to change. Call for quotes. Prices include 20% French VAT. In one action-packed day, you can experience three incredible flights, plus a parachute jump. The excitement takes place a three-hour train ride from Paris, near the sea, in the village of La Roche-sur-Yon. Your adventure begins with a flight in the ASH 25 Glider. Sail the sky with Champion Glider Pilot Francois Dubreuil. Add a parachute jump guaranteed to get your adrenaline flowing. 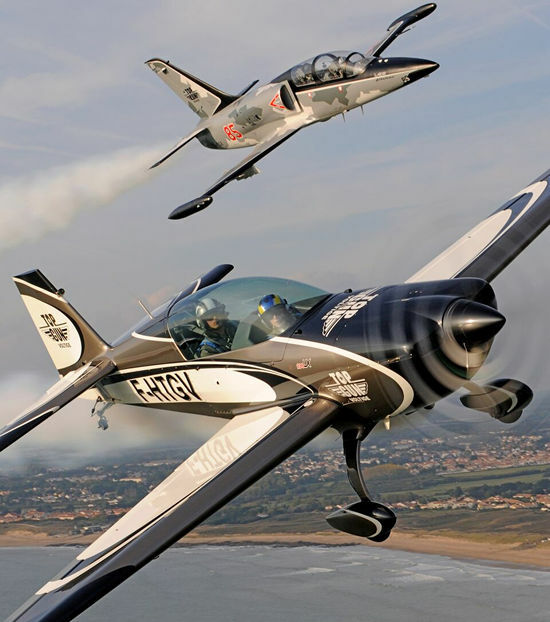 Next, it's time to experience extreme aerobatics in the all-new GB1 GameBird, a German-designed and American-built "unlimited" category aircraft. After a break for lunch, it's on to the main event....a high-speed, high-g sortie over the sea in the L-39 Albatros. Opportunity to fly an RC Model. Includes Lunch and VIP Reception. Includes Deluxe Photos and Video. Includes Luxury oceanfront accommodations for two people in nearby Les Sables d'Olonne - the 4 Star Cote Ouest Hotel Thalasso & Spa. This VIP adventure is currently priced at $13,925 US*. For more information, send us an email or call us at 800-644-7382. The ASH-25 is a two - seat high - performance Open Class glider with a wingspan of 25.6 meters (84 ft) and a never-exceed speed of 280 km/h (174 mph). It has a glide ratio of 60:1. Adventurer Steve Fossett set 11 world aviation records in the ASH-25. The all-new German-designed and American built GameBird from Game Composites is light, fast, easy to fly and purpose built for aerobatic performance. The GameBird is rated to withstand +/ - 10 g’s. It has a maneuvering speed of 200 mph and a never-exceed speed of 270 mph. 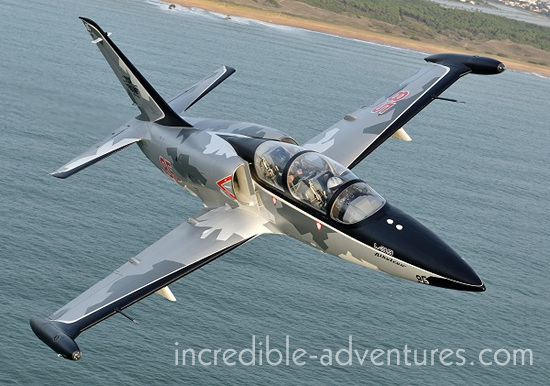 The Czech-made L - 39 is a high-performance military jet trainer produced by Aero Vodochody. The single-engine, subsonic jet aircraft has been used by more than 30 air forces to prepare fighter pilots for air combat. The L-39 has a maximum level speed at altitude of 780 km/h (485 mph) and is rated to handle +8/ - 4 g’s. Flights take off from Aerodrome de La Roche-sur-Yon - Les Ajoncs, located near the sea on the western coast of France. The aerodrome is roughly a three-hour train ride from Paris. The closest international airport is about a 45 - minute drive away, in the town of Nantes. La Roche-sur-Yon has a population of about 55,000 and is the capital of Vendee. The town was founded by Napoleon and offers much to see and do. When are flights available? The Grand Slam Adventure is available from April through October, on select dates. A version of the adventure without the skydive can be arranged all year long. Call or email to check date availability. What is the minimum age to fly? You must be at least 15 to fly the L-39. Other flights are available to those age 12 and over. There is no maximum age. Can I bring a guest to watch me fly? Yes. Will I get video? Yes. The Grand Slam Adventure includes deluxe video and photos. Flights are offered in partnership with Top Gun Voltige .